The dog’s name came from the direction of the enclosed front porch of the tin-roofed concrete block home of my friend Bwana Ndege, in Isiro, Zaire. It sounded like an older woman, a somewhat crackly voice, insistent. The old woman was calling the dog, in Swahili. Nebo, sleeping at first on the cool concrete floor under the dining room table startled awake, ears scanning. Nebo was a large Doberman who had never learned that one-man one-dog thing. He was gentle. And listening carefully. “Nebo.” Louder, more insistent, the voice from the porch called. This time Nebo got it, jumped up, pushed his way past the legs of chairs and bounded past me in the living room, and onto the porch. Nobody there. Who had called him? I wondered if dogs ever considered that they might have dreamt something they they thought they had heard. Perhaps thinking that, Nebo looked around for a moment, and retired to his cool sleeping spot in the interior of the house. “Heh, heh, heh, heh,” the old woman cackled. Bwana Ndege’s African Grey Parrot had fooled the dog again. And was clearly amused. This happened three or four times that afternoon. It happened several times a day as long as the Parrot was alone on the porch and things were quite. Nebo never go it. The parrot always laughed. In many species, individuals benefit from social associations, but they must balance these benefits with the costs of competition for resources. 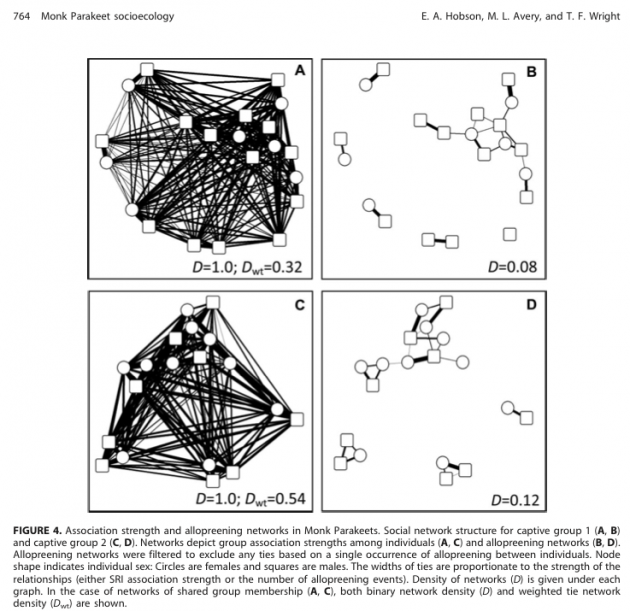 Understanding how these competing factors generate diversity in social systems is a major goal of behavioral ecology, but one that has been hampered by a lack of basic data quantifying many aspects of social structure and associations. Although parrots are generally assumed to have complex social groups, few studies have quantitatively examined these assumptions about parrot social structure. We critically assessed 4 assumptions about parrot socioecology using data from captive and wild groups of Monk Parakeets (Myiopsitta monachus). We evaluated (1) whether pairs are the fundamental unit of parrot social structure, (2) the patterns and extent of fission–fusion dynamics, (3) patterns of aggression and dominance hierarchy structure, and (4) whether individuals share foraging information. We found evidence that supported pairs as the fundamental unit of social structure, although these close associates were not always heterosexual breeding pairs and were sometimes trios. Fission and fusion of subgroups were common, and the amount of fission–fusion dynamics varied across flock types and by fission–fusion dimension, but the amount of variation among dimensions was consistent across replicate captive social groups. Despite these levels of fission–fusion dynamics, study of aggressive interactions in our 2 captive groups indicated that dominance hierarchies existed. Hierarchies were moderately linear (0.7) but not steep (,0.1). 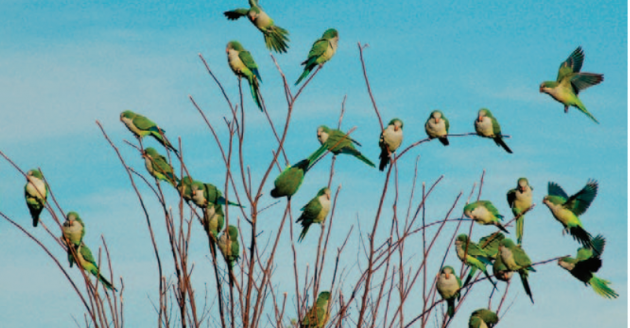 Finally, we found no evidence that Monk Parakeets share foraging information among groups through active vocal recruitment to foraging flocks. We compared these patterns with those documented for other species of parrots and other cognitively complex large- brained species. We consider the implications of our results for the study of the evolution of complex sociality and highlight several future directions for parrot socioecology research. That is a very well written abstract using actual English Language so I don’t feel a need to interpret it for you. Plus, the article is freely available (click the link above). Plus, at the moment, I don’t have any great insights to add to this. Note that Monk parrots are not communicating much, but they are interacting socially in complex ways. I suspect other parrots, especially African Greys, are communicating. This is simply an impression I get from watching them in the wild. Oh, and Bwana Ndege’s parrot … fooling Nebo and laughing about it. Not a scientific study, but a mighty impressive bit of Parrot behavior. Interesting post! I was just in Madrid and saw feral flocks of Monk Parakeets in the parks. I thought they were originally from Argentina, not Africa? Yes, Wendy, you are correct; they are from Argentina and nearby areas. But my only really good parrot story is the African Grey, so I used that here.